"Nihao, Xiexie!" one by one, the 40-some Italian children, aged from 5 to 12, greet their Chinese audience. They are members of the Piccolo Coro dell'Antoniano, or the Little Choir of Antoniano, a renowned children's choir in Italy. The choir members greet their audience after each concert in China by walking down from the stage and high-fiving their fans. In the three days of the New Year holiday, the choir gave six concerts at the Shanghai Children's Art Theatre (SHCAT), followed by another two at Jiangsu Center for the Performing Arts. "I really enjoyed the concert, even though most songs were in Italian," Li Chenlin, a Beijing mother, told the Global Times after a concert at SHCAT. Li brought her 2-year-old daughter and 6-year-old nephew all the way to Shanghai just for the concert. "I think I will attend next year as well." It was the fourth year in a row that the children's choir sang in the New Year in Shanghai. After four years of promotion in China, the Piccolo Coro's New Year concerts have become one of the most popular shows in the market. Tickets for this year's Shanghai concerts sold out in only 41 seconds, breaking the record of 44 seconds last time, according to SHCAT's official WeChat account. The Piccolo Coro, based in Bologna, is the most famous children's choir in Italy. It was established in 1963 and was named a Good Will Ambassador for the United Nations International Children's Emergency Fund in 2003. Through its history, the choir has recorded some 1,000 songs, toured throughout Europe and taken part in TV and radio broadcasts. 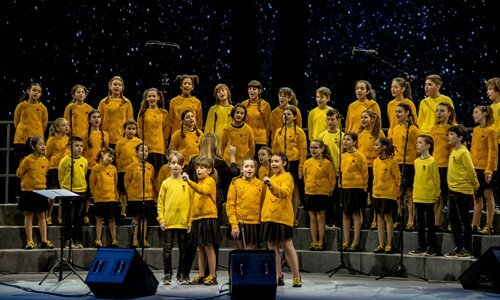 Most of their songs are from the Zecchino d'Oro, an international competition for composers of children's songs that takes place in Bologna annually. 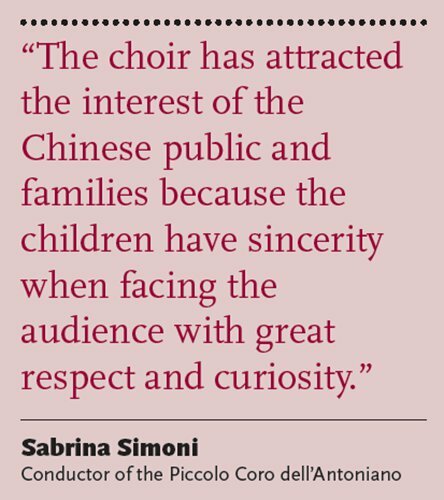 "Our vocal and performing styles are very joyful, which is reflected in our performance," Sabrina Simoni, conductor of the Piccolo Coro dell'Antoniano, told the Global Times. The fan frenzy over the Italian choir reflects the prosperity of China's performing arts market, which grew to around 48.9 billion yuan ($7.2 billion) in 2017, and insiders and investors expect it to become the world's largest, according to a report by damai.cn, a ticket sales website, in September. The rapidly growing market has attracted a number of foreign arts groups seeking a larger audience and big fortunes, especially around New Year. From December 21, 2018 to January 6, as many as 50 New Year concerts were held in Beijing. However, the market is also in a mess - in one week, more than 10 orchestras with "Vienna" in their names held concerts in the capital city. "It was more like a noisy tea party than a real concert," a Beijinger surnamed Chen who attended one of the "Vienna" concerts during the New Year holiday, told the Global Times. "You'd better google before you buy tickets," Helene Zhang, a performing arts industry insider, told the Global Times. "But it is difficult to put regulations on the market." This year, the program of the Piccolo Coro dell'Antoniano included songs about Wolfgang Mozart, a nerdy otaku spider and a vegetarian zombie. They also performed "Funiculi Funicula," an Italian folk song often sung by Pavarotti and Andrea Bocelli, and "Una vita in vacanza," a pop song calling on office workers to take a break. The most classic was "What does the crocodile say?" a well-known song in Italy. For the Chinese audience, mimicking the sounds of animals was a lot of fun. "Their music is so magical that you fall in love with it without knowing it," Tian Yao, 22, from Shanghai said. "It has been the happiest day of my life to see them in concert," Li Yan, 19, from Shaanxi Province, told the Global Times. "Their music is for people of all ages. Also, at different ages you have a different understanding when listening to them," Wu Han, an 18-year-old freshman at a university in Wuhan, Hubei Province, told the Global Times. To guarantee his spot in the Piccolo Coro audience, Wu asked 10 friends to help buy tickets after setting an alarm clock. In the 41-second fight, Wu's team got 12 tickets, but he only needed two, so they had to refund the rest. "I have been in the choir for six years, and it is my fourth time to China," Emanuele, a 9-year-old member of the Piccolo Coro dell'Antoniano, told the Global Times during a break between two concerts in Shanghai. He said that his favorite thing about China is shopping. The children have come to appreciate many things about China. Some love Chinese food, some have made Chinese friends, while others like the Great Wall and still others "the fake market." In the past decade, the Piccolo Coro has amassed a huge following in China. The choir even has a dedicated group of fans in China who have been translating the Piccolo Coro's music, making subtitles and promoting the choir online for a decade. "The Piccolo Coro is unique, with high-quality, cheerful and carefree performances on stage," Zhu Yiyun, one of the leading members of the AmiCinesi, the Piccolo Coro's fan group in China, told the Global Times. Zhu, who used to be a chorus conductor himself, considers the Piccolo Coro the best choir he knows. 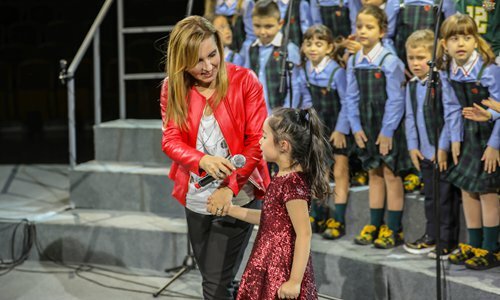 Simoni said that "the choir has attracted the interest of the Chinese public and families because the children have sincerity when facing the audience with great respect and curiosity." In recent years, the choir has also learned several Chinese songs, including the famous "Mo Li Hua (Jasmine)." Their perfect pronunciation surprised the Chinese audience. "Chinese music is artistic… We sing Chinese songs not only because we want to thank those who invited us to China, but also because the music fascinates us," Simoni said. Not all New Year performances have left audiences satisfied. Chen, a concertgoer in Beijing, still feels she was deceived. The concert she attended, the New Year concert of the Sound of Spring orchestra from Vienna, was held at the Great Hall of the People in Beijing on December 30, 2018. The stage was temporary. The organizer put out some chairs for the audience. "Many audience members stood up to take videos with their phones and they talked and walked around," Chen said. "I was angry," she continued, describing the atmosphere as that of a "tea party." Chen paid 3,120 yuan for four tickets. "Only my parents are happy, because they could visit the Great Hall of the People," she said. "The New Year concert in Vienna is well known, so the public would love to hear a performance by a group with 'Vienna' in its name," said Helene Zhang, the performing arts industry insider. "But there are more low-level musicians in Vienna than stray cats in Beijing!" "These orchestras usually play cliché programs that school-level bands can also play. But many people who only know these pieces would buy tickets," said Zhang. Zhang suggested consumers google the original German names of these "Vienna" groups before buying tickets. "If it is all familiar pieces on the program, then it must be a third-tier group." In addition to "Vienna," words like "royal," "Strauss," "world-class" and "philharmonic orchestra" are also frequently used to promote performances to attract Chinese audiences. Zhang Yunyi, a Beijing-based theatre fan, told the Global Times that some foreign performance groups even copy the names of other famous groups while promoting themselves in China. "We have low-quality or fake groups here in China, and those agencies and promoters who have no conscience," he said. "I resist such performances." "The regulation on foreign art groups entering the Chinese market needs to be improved in the future," Li Xinyu, an analyst in the performing arts industry, was quoted by Beijing Business Today as saying. He said that even though Chinese audiences are becoming more knowledgeable, it is still not enough. Meanwhile, China should foster young domestic artists. "Only by working on both audience and performing groups can we fix the chaotic performing arts market."